Taken on its own as a standalone product, Halo 4 is not the worst video game I’ve ever played, but when one considers the legacy traced out by its Forerunners, the newest Halo Installation stands alongside The Phantom Menace as one of the entertainment industry’s biggest letdowns in history. After completion of the excellent prequel Reach, the series’ creator Bungie appropriately called the story a wrap and surrendered the wheel to 343 Industries, which is fast proving itself to be a drunken driver. Halo 4’s story is a convoluted and incomprehensible mess marked by corny dialogue, dull pacing, bad editing, and lackluster character development. In seeking to raise the pathos of the campaign, 343 wrecked the emotional impact of the story; in trying to tell a compelling sci-fi epic, they stripped the story of logos. The game is a massive disappointment overall, and signifies the rampancy of the new trilogy. The game opens 5 years after the perfectly satisfying conclusion of Halo 3, wherein (spoiler to all those cavemen who haven’t completed the trilogy) Master Chief saved the universe from the Flood by prematurely firing a Halo ring above the Ark, thus destroying the parasite, and inadvertently split his ride off the world, the UNSC cruiser Forward Unto Dawn, into two parts. The Chief’s half drifted off into uncharted space while the Arbiter’s side arrived at Earth, where humanity gave the Spartan a reverent 21-gun salute and most declared him dead. “Were it so easy.” In reality, Chief entered cryo sleep and told his endearing A.I. companion Cortana, “Wake me when you need me,” which she eventually does after the ship’s systems report a breach on multiple levels. The once-dynamic duo soon identify the invaders as radical Covenant forces, leftovers from the war whose arrival at F.U.D. is never really explained. The Chief executes the aliens only to have his ship be sucked into a gravity well originating from a metallic Forerunner planet called Requiem. Cortana’s rapidly ailing condition complicates matters: A.I.s start to deteriorate 7 years from their enlistment, undergoing a process called rampancy, which ultimately causes the programs to “literally think themselves to death”. The only way Chief can prevent his friend’s demise is to locate the donor of her DNA, who in Cortana’s case is Dr. Catherine Halsey, the mastermind behind the controversial Spartan program. Halsey played a significant part in the Halo novels before her debut in Reach, and although she appears momentarily in Halo 4’s opening cinematic, the scene is never tied back into the rest of the game. Before he can return Cortana to Halsey, Chief has to overcome several hurdles including a dastardly Forerunner villain (equivalent in position to the Gravemind or the Prophet of Truth, but not as interesting), swarms of Covenant and Prometheans (did the Greeks ever foresee the Titan’s immense popularity in American pop culture? ), and a lot of irresistible buttons. Before I proceed to lampoon almost every aspect of Halo 4’s story and gameplay, I must give what little credit the game is due. 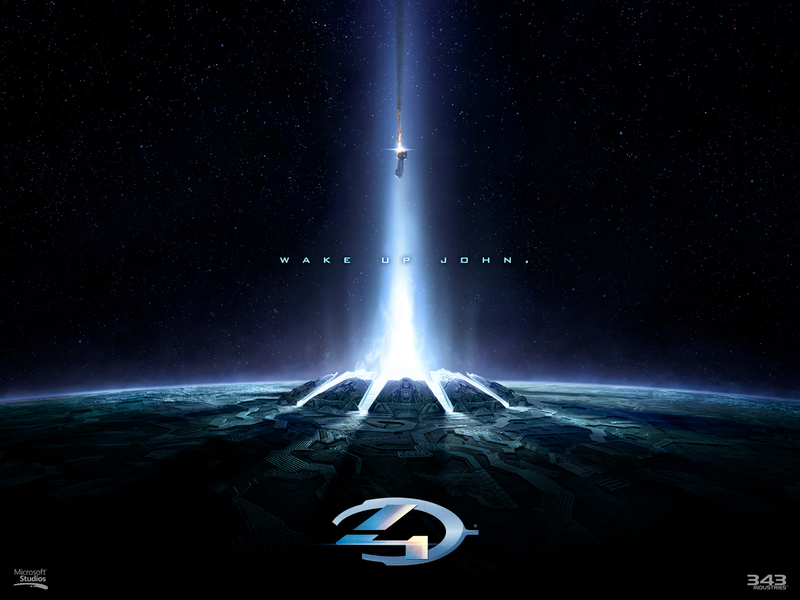 Neil Davidge’s musical score was far better than I anticipated; he’s not the equal of Martin O’Donnell and Michael Salvatori, but his work still retains the grandeur and mystery that Halo’s music has always conveyed. The CD of the soundtrack is sadly incomplete, but I’d recommend purchasing it anyway, or at least the following tracks: Awakening, To Galaxy, 117, Arrival, and Revival. It’s a distinct departure from the sound of Bungie’s games, but memorable and exciting nonetheless. The sound effects on the weapons and vehicles are commendable, per norm. The motion-capture animation, especially on the faces, is superb but for some occasional lip syncing issues. The game’s art design is also impressive, although it steals from Tron, and Requiem’s appearance captures the majesty of Halo’s other environments; unfortunately, its impact is marred by unbearable gameplay and an atrocious narrative. * Spoilers from this point on until further notice, but for $60 the Xbox owner deserves to be spoiled/warned beforehand. Halo 4’s worst attribute is probably its storytelling. The plot is incomprehensible from the moment we first see the Covenant and just gets more confusing as the main villain is revealed. Many questions are unanswered, as in Prometheus, and the writers assume that players will absorb many details which are never formally disclosed in the game. An early example of this is the entrance of the game’s antagonist, who characteristically delivers an evil monologue while force-choking the Chief before hurling him to the ground with force-push. John gets to his feet and runs away, but a white light flashes behind him, somehow warping him to a completely different scene without any explanation. As if the level wasn’t unclear enough already, Cortana pipes up and says that Chief “has to stop that Didact,” even though the creepy armored guy never provided his name. In fact, the Vader wannabe never supplied so much as an introduction, a motive, or an evil agenda, spewing only cryptic nonsense like, “Time was your ally, human. It has abandoned you.” The Didact is just another generic, one-dimensional, Hollywood bad guy with no real purpose other than to scan things inquisitively with his orange sci-fi laser and vaporize random humans senselessly. Religious zealotry drove the Covenant, irrational duty and utopianism the Oracle (that is, 343 Guilty Spark), and natural instinct the Flood, but the Didact has no motive. He merely epitomizes the lack of complex, believable characters in Halo 4. Nevertheless, Cortana and Master Chief somehow perceive a deeper side to the villain and know all about his plans right off the bat. Indeed, our two heroes always seem to be one step ahead of the gamer. After another especially confusing cinematic later in the game, Chief remarks to Cortana, “I know what the Didact wants,” but never bothers to elaborate for her enlightenment or the player’s. It’s as if 343i knew the story they wanted to tell but couldn’t transcribe their ideas into a legible product. Eventually the two companions run into some UNSC troops from the vessel Infinity. Not only do the writers neglect to establish clearly why Chief has close friendships with certain members of the ship, but they also leave unclear why the crew is so unsurprised that the legendary Spartan is alive and well. Perhaps there’s a novel you can buy that explains it all, but Halo 4 itself is an unsolvable mystery, a unforgivable smite against the consumer given that the preceding games were all self-contained works that one could enjoy without possession of any outside knowledge. To describe the new Halo in one word, the campaign feels woefully incomplete, like an unfinished draft that was never submitted to beta. Plot holes abound and the story is fraught with abrupt scene changes. At one point, John gets transported inexplicably from an open, gray, Library-esque chamber to an indistinct, heaven-like place where he receives a garbled, utterly indecipherable history lesson about the Forerunners from a ghostly woman called the Librarian. Chief speaks to her as if they’ve had a long-running relationship and effectively excludes the player, who doesn’t know the Librarian, from the conversation. The game’s writing is plagued with conceptual issues like this: the player cannot be immersed in the story if the character he embodies has ulterior knowledge that isn’t shared. Good video games, especially 1st-person ones, follow an initially ignorant character who absorbs information throughout the story and grows in knowledge ALONG WITH THE PLAYER. Portal, Knights of the Old Republic, and Bungie’s Halo are all story-driven games that have used this approach to great effect. Halo 4 takes the opposite route by focusing on characters who are perpetually smarter than the person with the controller, and thus the plot makes no sense. 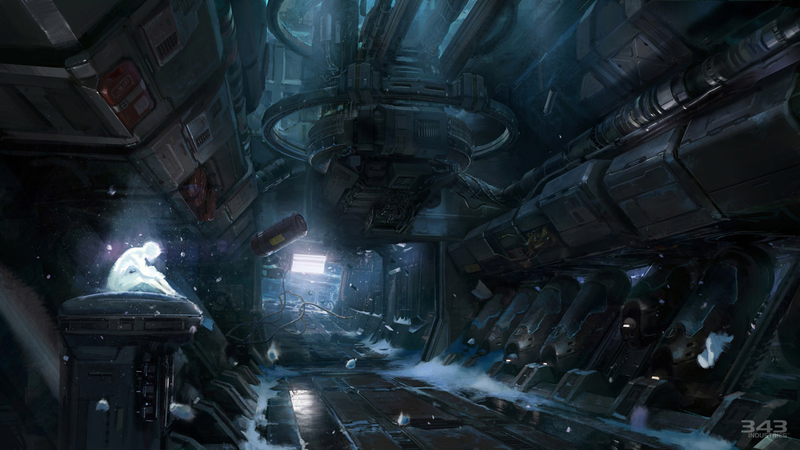 Clarity isn’t the only issue bogging down Halo 4’s storyline. 343i stated that they wanted to increase the drama of the game by “drawing out the humanity” of Master Chief and further delving into his relationship with Cortana. There are several problems with this: first of all, the studio tried to fix a system that wasn’t broken. Nobody to my knowledge cared that John was just an emotionless, indoctrinated supersoldier in the Bungie titles because that’s all the original story required him to be. The first Halo trilogy was never supposed to be a “character analysis” of troubled individuals, but an epic, good-vs.-evil space drama like Star Wars where action, conflict, and mystery drove the plot. There was a layer of character development present in the Bungie-developed games, but the writers conveyed it subtly without ever compromising the plausibility of the larger narrative or its emotional impact. The old Halo games delivered drama impeccably, and Halo 4 goes astray precisely because it tampers with the original formula and tries to forcibly inject “soul” into characters who didn’t need it or already had it. 343i’s efforts to mend the franchise only result in a sloppy and awkward love story between a faceless metal man and a computer program. The love subplot of ODST demonstrated just how incompatible Halo is with romance, and 343i’s escapades into the genre fare even worse than Bungie’s. The romantic dimension is introduced early on and only gets more excruciating as Cortana evolves into the damsel in distress and becomes increasingly reliant on Chief’s comfort, reassurances, and periodic dates. “Come on, Chief. Take a girl for a ride,” she says, exhorting the Spartan to take a Pelican for a spin. How dialogue like this ever got approved is beyond my comprehension. Here’s more: “*Sniff* You’ll be given another A.I. partner, maybe another Halsey model. *Sniff*.” “That’s NOT going to happen.” Critics have hailed Halo 4’s love story as emotional and tear-jerking, but few have had the courage and/or intelligence to state the truth of the matter, which is that the new boy-girl dynamic is poorly executed, unnecessary, and forced. Halo 4 is just more proof that love stories don’t belong in the majority of video games. To top things off, the story is completely implausible, as evidenced by the ending. In the lead up to the final boss battle, the player will die about a dozen times at the hands of generic minor opponents armed with light firearms. However, when the Chief finally does press the last button in the game and face off against the Didact, he not only endures the awesome force powers of the villain, who predictably gives another indulgent monologue that grants Cortana enough time to attack him, but he also survives a nuclear explosion which rends the Didact’s giant metal ship asunder. Presumably Cortana saves him with a fireball-proof forcefield, but the script doesn’t make the conclusion very clear. All we know is that Master Chief evades atomic death to press more buttons and rescue his girlfriend in another game. Or maybe Cortana is gone for good, a probable scenario given the incompetence of the writers and their propensity to introduce and eliminate characters within the same level. Whatever the case, one can be reasonably certain that players will cross paths with the Didact again, as the after-credits scene illuminates that he too was able to survive an explosion which would tear his very atoms apart. “The Reclamation,” he laments, “has already begun.” Alas, it has not ended. Regardless of the story’s flaws, the gameplay itself is painful and feels like something out of an Atari 8-bit classic instead of a 21st century blockbuster game with a $100M budget. Former Halo games have been distinguished by challenging enemies, diverse level design, and story-driven objectives. A particular level in Reach has the player fight through a bunch of suicidal aliens, rescue some civilians, defend an elevator, jetpack through a massive city to reach a landing pad, clear it, hop in a Osprey-like helicopter, ride it to a beach while gunning down bad guys in a turret, activate two missile batteries, and fire them to drive off the Covenant’s cruisers. Bungie’s Halo rarely subjected the player to tasks which seemed unnecessary to advancing the story, and thus the original games had a cinematic quality to them. In contrast, Halo 4’s objectives seem more like menial time-fillers than a means to progress a plot. 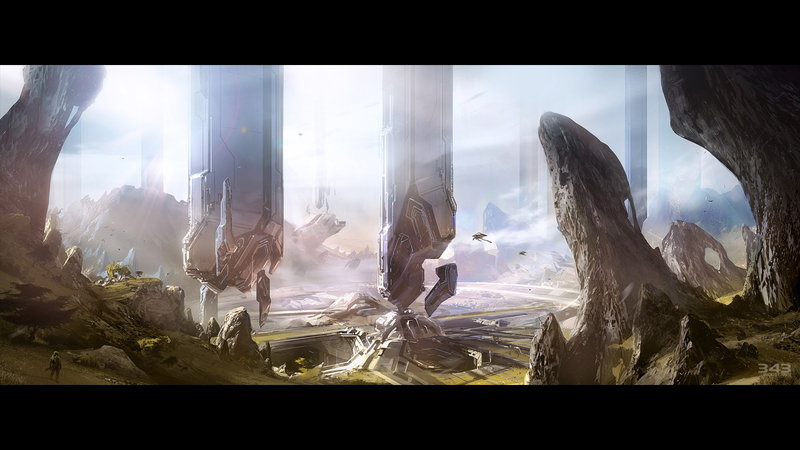 A typical Halo 4 level goes as follows: run through a portal, follow a trail, get ammo, enter a large, open area and dispatch 50 bad guys, destroy 3 energy orbs/generators, move on to the next area, press a button, jump through another portal, follow another oddly familiar trail, reload, kill 50 more bad guys, destroy 3 more objects, press another button, jump through one more portal, kill 50 bad guys as you go through the same room twice, and press one final button. I would estimate that 90% of the time Master Chief is fighting through bad guys to press a button or destroy something that’s blocking his path. Almost the entire storyline, including the final boss battle, is directed by the necessity of plugging Cortana into some circuit so she can scream and wail while flashing red. “Plug me in, Chief,” and “Pull me, Chief,” alone comprise a good portion of the game’s script (think “Wall-e!” and “EEEVAAAA!!!”). The level design is simply a disgrace to the series and gives new meaning to the word monotony. If the actual layout of the campaign wasn’t bad enough, the player also must suffer through a deluge of bad programming. Halo 4 retains all the original Covenant from CE and introduces 3 new enemies called Prometheans. We have the grenade-happy, teleporting Knight, who represents the elite of his robotic clan, his ferocious hellhounds, which have guns for heads, and the watchers, flying thingies with weak firepower but powers of resurrection and shielding. The Prometheans substantially increase the difficulty of the campaign, but for all the wrong reasons. Instead of being smarter or stronger than the Covenant, the Prometheans just cheat, whether by warping to another area so they can heal or by reviving each other after Master Chief kills them fair and square. Master Chief has neither multiple lives nor the ability to teleport, so it would seem that the Prometheans have an inherent, unfair advantage over the player. Fortunately, or unfortunately depending on how you view it, this advantage is unbalanced by the atrocious artificial intelligence. The computer-controlled opposition in former Halo games was always intimidating because the aliens were intent on the player’s annihilation. The Covenant worked cooperatively and aggressively to halt the Chief’s progress; they were a force to be reckoned with, and the difficulty stemmed not from a scarcity of checkpoints but from the struggle to reach them. The Prometheans and the new Covenant are either incompetent or passive in dealing with Master Chief. Enemies often run around in circles aimlessly, firing a few rounds at the player before turning in the opposite direction and running away. This is especially true of the mechanical pups, which hop all over the place like coyotes. Sometimes the enemy will empty several magazines on the Chief only to forget about the Spartan entirely when the player ducks behind cover for a certain period of time. Promethean Knights will fire on the player until he hides, then return to their long back-and-forth patrol routes, which is basically their way of begging to be assassinated. Other reviewers have noted the inability of the A.I. to properly gauge distance and make logical decisions based on it. The bad guys, both Covenant and Forerunner, tend to use every gun at their disposal as a sniper rifle, firing short-range pistols, automatic weapons, and shotguns at the Chief even from a hundred yards away. The stupidity of this behavior is nauseating. The developers at 343i also deemed it prudent to make the “catch” skull a permanent feature. The automatic impulse of any Knight or Elite upon spying the player is to throw a grenade. The second thing on its mind is to throw a grenade. If the Chief is still alive, the alien will charge/warp at him and finish the player off with a melee. For a 1st person shooter, Halo 4 offers a startling lack of shooting on the part of the bad guys. Several guns, armor abilities, and a new vehicle were added to the game, but few of them are unique or fun to wield. Some weapons, like the Promethean pistol, the Covenant beam rifle, and especially the sucky (pun intended) forcefield grenade, are next to worthless, while others are effective copies of each other (battle rifle, DMR, carbine, light rifle). Small vehicles are once again prone to crashing and flipping, and the new mechwarrior does little to freshen the repetitive gameplay. New armor abilities include an autonomous portable turret, a boost pack, the hardlight shield (temporary Promethean version of the jackals’ signature equipment), and x-rayish Promethean vision, a pointless addition that’s thrown in just for the sake of a foggy sequence in one level. The turret proves most invaluable during the campaign, sparing the player a lot of tedious killing, but it’s a boring alternative to tools like active camouflage, a jetpack, or holograms, none of which are an efficient means of beating levels. The only improvements in Halo 4’s gameplay I can fathom are that sprint is now permanently mapped to a button and that absorbing fire no longer takes the player out of his scope while sniping. Even these changes are unnecessary and could be rectified with smaller levels, more ammunition (and hence less scavenging), and smarter enemies who don’t snipe with plasma pistols. Other reviewers have been nearly unanimous in their praise of the game’s graphics, but I actually think they’re a step down from the visuals of Halo 3. While Halo 4 for the most part has better textures and more detailed character models than its predecessors, it falters in its particle and physics effects. All the other Halo titles on the 360 have borne acclaim for their explosions and physics programming; when a vehicle exploded in Halo 3, it fragmented in a burst of detailed flames and many pieces of debris would continue to fly in the direction the vehicle had been traveling. The trajectory of objects was influenced by inertia, such that the destruction of an overhead banshee or a speeding ghost could result in a second death if the destroyer doesn’t avoid the flying wreckage. Halo Reach and ODST particularly had animation that could rival the special effects of a summer blockbuster. Explosions in Halo 4 are dull and unremarkable in comparison. In fact, the game’s explosions are so lackluster that the cutscene directors deliberately avoid animating them wherever possible. No fewer than 5 times in the game, the screen will fill with white light right before a devastating crash or explosion, conveniently eliminating the need for an awesome CG effect. The CG effects we do witness are pathetic. For instance, when one blows up a large alien dropship, it will form a small pink blast then split into 2 or 3 round chunks of metal that bear no resemblance to the original vehicle, whereas in Halo 3 the same ship would divide into many distinct pieces that the player could mentally piece together into a complete Phantom. Halo 4 discards the built-in inertia of former titles: a hovercraft in motion stays in motion unless the player kills it, in which case it will drop to the ground magnetically. Gone also are the so-called ragdoll physics of the later Bungie games, wherein the A.I.s would fall and fly according to the location of projectiles and nearby detonations. Halo 4 chooses instead to emulate Combat Evolved, where enemies had a total of 2 death animations each, yet the Prometheans lack even these, simply dissolving when killed. I must also nag about Cortana’s redesign. The character had formerly possessed a feminine grace and maturity of appearance that overshadowed her somewhat provocative garb, viz. nothing. 343i’s Cortana looks and sounds less like a lady and more like a whiny, emotionally distraught teenager who obsesses over her vanity. That the studio rehired Jen Taylor to voice the character doesn’t mask the banal dialogue and obnoxious voice distortions that escalate with her rampancy. Aside from ruining the campaign, 343i also regressed by removing the Firefight mode and fundamentally altering the competitive multiplayer. The Firefight replacement, Spartan Ops, is intended to build on the game’s story, but in reality the short episodic missions just rehash maps from the campaign, rearranging the layout of enemy forces and adding waypoints. The level formula is cut and paste from the campaign, which means you’ll be pressing a lot of buttons and killing a ton of bad guys to reach them, except you’ll be playing as a generic Spartan nobody instead of the Chief. Firefight was fun in ODST and Reach because it was a simple, arcade-like alternative to the story; Spartan Ops tries to replicate Halo 4’s miserable campaign, and suffers as a result. It also baffles me why Microsoft would limit this service to Gold members of Xbox Live, for the player can undertake the Ops solo as well as with a team. The multiplayer also got an unwanted “upgrade” which completely reverses the former principles of equality that guided the matchmaking experience. In classic Halo, all competitors started on equal ground with the same selection of weapons and armor abilities. Apparently 343i thought this concept was outdated, so they redesigned the multiplayer to better reflect the class warfare of modern politics. Now Spartans receive level-ups and experience points which they can spend on better weapons, upgrades, and abilities. The more you play, the more points you accrue and the easier you can pick on newbies who start with the puny assault rifle and magnum. Thanks, 343i, for fixing another unbroken system. Heaven forbid that the series’ developers solve a real problem, such as the inability to toggle friendly fire for team-based games online.